THESE HAVE BEEN WITH ME AS LONG AS 25 YEARS. MOST HAVE BEEN BOUGHT OVER THE YEARS, THEN SENT OFF FOR GRADING. IMPERIAL STORMTROOPER - PALITORY 65 BACK 90% MINT. BEING A PALITORY NO ONE KNOWS IF THIS WAS PUT TOGETHER OUTSIDE THE FACTORY USING ORIGINAL PARTS. 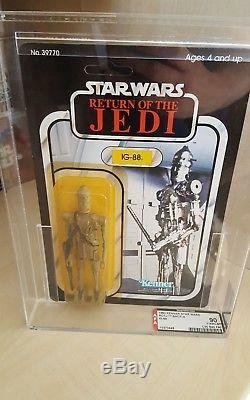 IG-88 - KENNER 77 BACK Y90-NM+%. 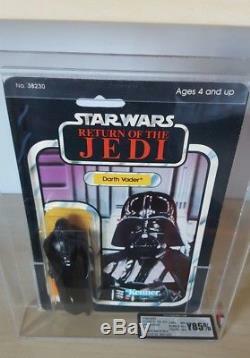 DARTH VADER - KENNER 65 BACK Y85% UKG SEALED. AT-AT - KENNER 65 BACK Y85% UKG SEALED. REBEL COMMANDER - KENNER 77 BACK Y85% UKG SEALED. SQUID HEAD - KENNER 77 BACK 85% UKG SEALED. WALRUS MAN - KENNER 45 BACK 85%NM+ AFA SEALED. 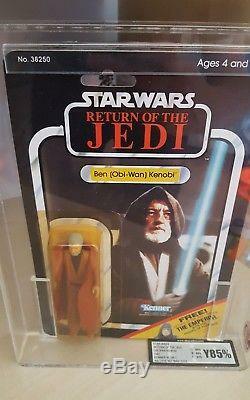 BEN OBI-WAN KENOBI - KENNER 65 BACK Y85% UKG SEALED. KLAATU - KENNER 77 BACK 85%NM+ AFA SEALED. 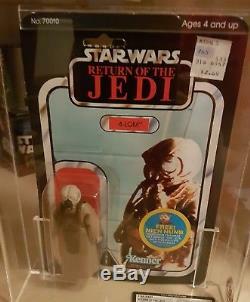 ADMIRAL ACKBAR - KENNER 65 BACK Y85%NM+ AFA SEALED. WEEQUAY- KENNER 77 BACK Y80%NM AFA SEALED. 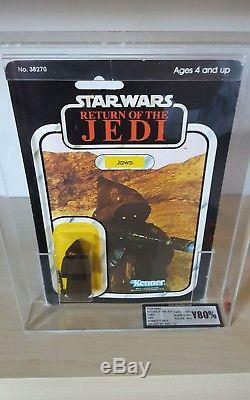 JAWA -KENNER 77 BACK Y80% UKG SEALED. KLAATU -KENNER 65 BACK 80%NM AFA SEALED. AT-ST DRIVER -KENNER 77 BACK 80%NM AFA SEALED. HAN-SOLO TRENCH COAT - KENNER 79 BACK Y80% UKG SEALED. GAMORREAN GUARD -KENNER 77 BACK Y80% UKG SEALED. 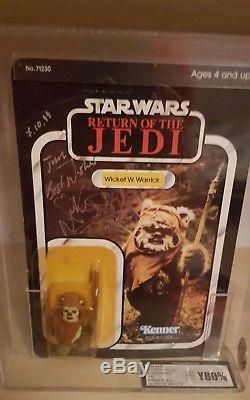 WARRICK -KENNER 77 BACK Y80% UKG SEALED. PRINCESS LEIA COMBAT PONCHO - KENNER 77 BACK Y80% UKG SEALED. CHIEF CHIRPA - KENNER 65 BACK 80% UKG SEALED. PRUNE FACE - KENNER 77 BACK 80% UKG SEALED. BIB FORTUNA - KENNER 77 BACK Y80% UKG SEALED. BIKER SCOUT - KENNER 77 BACK Y80% UKG SEALED. 8D8- KENNER 77 BACK Y80% UKG SEALED. AT-AT COMMANDER - KENNER 65 BACK Y80% UKG SEALED. LANDO CALRISSIAN - KENNER 65 BACK Y80% UKG SEALED. LOGRAY MEDICINE MAN -KENNER 77 BACK Y80% UKG SEALED. LANDO CALRISSIAN SKIFF GUARD -KENNER 77 BACK Y80% UKG SEALED. RANCOR KEEPER - KENNER 77 BACK Y80% UKG SEALED. 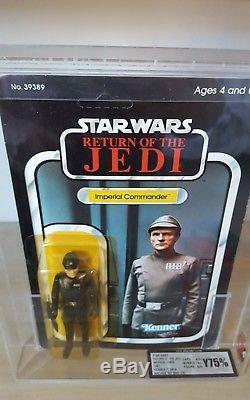 IMPERIAL COMMANDER - KENNER 77 BACK Y75% UKG SEALED. B-WING PILOT - KENNER 77 BACK 75EX+/NM AFA SEALED. 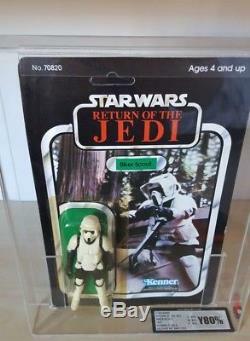 TEEBO - KENNER 79 BACK Y75% UKG SEALED. PRINCESS LEIA BOUSHH - KENNER 79 BACK Y75% UKG SEALED. 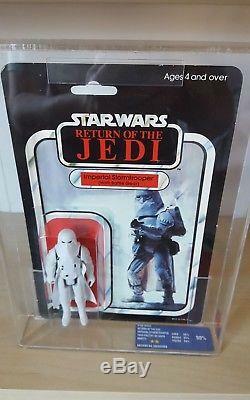 4-LOM - KENNER 48 BACK 75% UKG SEALED. TOO-ONEBEE - KENNER 77 BACK Y70% UKG SEALED. 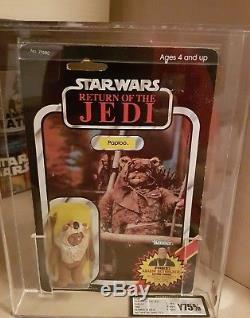 PAPLOO - KENNER 79 BACK Y75% UKG SEALED. 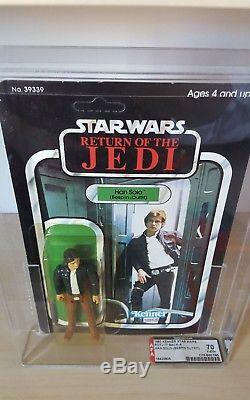 HAN SOLO - KENNER 77 BACK Y70-EX+ AFA SEALED. REE-YEES - KENNER 77 BACK 70EX+ AFA SEALED. NIKTO - KENNER 79 BACK Y85% UKG SEALED. BROKEN OUT OF BUBBLE ON WAY BACK FROM GRADING. LUKE SKYWALKER XWING FIGHTER PILOT KENNER 77 BACK COULD BE Y80%. 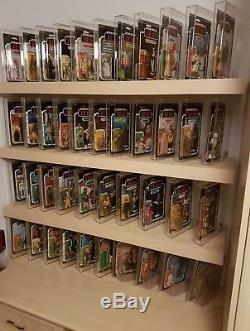 UGNAUGHT KENNER 65 BACK COULD BE 80+%. REBEL COMMANDO KENNER 65 BACK COULD BE Y75%. GENERAL MADINE KENNER 65 BACK COULD BE 60+%. R2D2 KENNER 77 BACK COULD BE Y60+ DUE BUBBLE DENT. See our Terms for details. The item "VINTAGE MOC, AFA, UKG GRADED ROTJ STARWARS. MAYBE THE BEST COLLECTION ON EBAY" is in sale since Saturday, July 14, 2018. This item is in the category "Toys & Games\Action Figures\TV, Movies & Video Games". The seller is "protectyourmobileuk" and is located in Burnley.